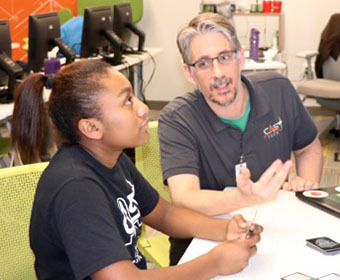 UTSA alumnus Don Davis prepares students for careers in the tech industry at CAST Tech High School. (March 7, 2018) -- Meet Don Davis ’17. He’s a computer science teacher at CAST Tech High School who’s helping students navigate the cyber world. Originally from Austin, Texas, Davis’ love for learning has led him all over the world. In his twenties, he pendeled back and forth between UT-Austin, where he earned degrees in German and English, and Berlin, Germany, where he spent seven years and began teaching. Later, he earned his master's in educational technology and taught English as a Second Language (ESL) classes at San Marcos High School. “Given my background as an immigrant in Germany and my history of teaching English as a foreign language, it was a natural fit and very rewarding for me to work as an ESL teacher,” said Davis. While teaching at San Marcos High School, though, Davis saw a significant discrepancy between the technology his students were expected to access and what was available at home. “These students, who could barely afford clothes, were expected to use expensive proprietary programs that they could not reasonably or sustainably have at home,” Davis said. Davis found a solution. He created the nonprofit organization Recycled Electronics and GNU/Linux Used for Education (REGLUE), which refurbishes computers to support student learning. But he wanted to do more. To advance his ability to influence educational policy, Davis pursued a doctoral degree at UTSA in interdisciplinary learning and teaching (ILT). Davis also built connections with UTSA professor Lee Mason and others at the TEAM Autism Research Center. The center, which focuses on teaching, research and community outreach, is located at the UTSA Downtown Campus. “UTSA is special in its incredible support for students. The university has a lot of systems in place to promote student success,” Davis said. After graduating from UTSA, Davis combined his loves of teaching and technology to pursue a position where he could make a difference by teaching computer science to students. He landed a job at San Antonio ISD’s CAST Tech High School, a cybersecurity magnet school that serves students in and outside the district. The majority of CAST Tech’s student households do not have internet access or a computer at home. Yet, the innovative high school is one of the few schools in San Antonio that requires computer science classes in its core curriculum. At CAST Tech, Davis is currently teaching ninth grade pre-AP computer science that includes topics such as phishing and personal online safety. He motivates students to expand their knowledge of technology outside of mobile apps and games while teaching them how to be active consumers in the market. “We teach students how to protect themselves and their families online. It’s all about showing our students how this material relates to them,” he said. Davis is partnering with UTSA computer science professor John Quarles and ILT professor Carmen Fies to research how to broaden cybersecurity interest among underrepresented students. Namely, Davis proposes to track students’ STEM identity and interest trajectories using implicit bias measures, which are more reliable than surveys. This multidisciplinary research should help students at CAST Tech, in SAISD and elsewhere by quantifying whether and how much various programs are truly growing students’ interests in computer science and cybersecurity.